This year the beautiful and extremely talented Cathie Allan will once again be teaching at both our events in Calgary and Edmonton. Her classes are PACKED with years of stamping and inking knowledge. Everything she creates starts with white cardstock. YEP – plain old white cardstock. 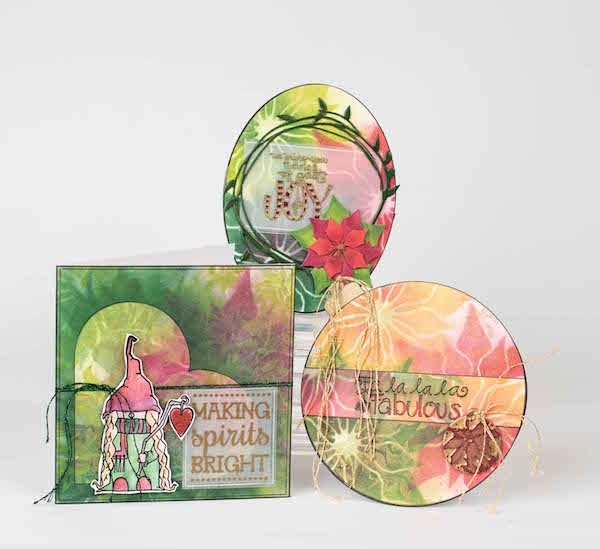 She teaches you to look at your stamps differently, how to take your ink to new levels, how to shade, how to highlight – EVERYTHING associated with stamping and inking. Honestly – if you are looking for tips and techniques to take your stamping new level – whether you are a beginner or a seasoned stamper – Cathie’s class is for you. One of the classes Cathie will be teaching is called a Bevy of Backgrounds. You will create these three Christmas cards to take away from the class with you. The cards feature a wide array of Clearsnap ColorBox products and the techniques will knock your socks off. But more than that – you will take away so much knowledge for the next project you create. What you will learn is way beyond a Christmas theme – you can apply these techniques to ANY THEME! CLICK HERE to find out more information about Cathie’s classes. WOW – we are a few days away from the Edmonton – Great Canadian Scrapbook Carnival. WE CAN HARDLY WAIT! The events are open to the public. You do not have to be registered to attend! That is correct – you can take a class – do make and takes, shop and have a coffee with us. Okay – you had me at SHOPPING!!!!! Each and every year we recieve hundreds of layouts – LITERALLY hundreds of layouts inspired by The Great Canadian Scrapbook Carnivals – they warm our hearts and make us smile. Here are just a few we would like to share with you. This year we are once again blown away by the generosity of our sponsors. These amazing companies go above and beyond to help bring to life these events – JUST FOR YOU!!!!! A big HUGE thank you to our sponsors for being leaders in the crafting industry AND for your continued generosity. THANK YOU FROM THE BOTTOM OF OUR HEARTS!!!!!! Inspiration you can FEEL, HOLD and LOVE! Can’t wait to see you Kendell!!!! !